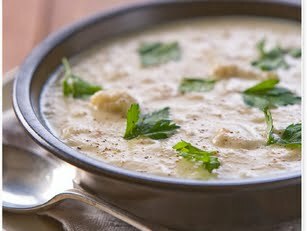 Pretty in Primal: Creamy, Chunky, Cauliflower-Bacon Soup! I have to admit that I'm something of a "soupmeister". I love soup and I make great soup! It's one of my absolute favorite things to make (and eat!) Although I've had to retire some of my old favorite recipes, such as provençal chickpea and fennel stew or white bean and kale soup, it gives me a great excuse to come up with new recipes! Tonight, I came up with a particularly winning and easy one: Cauliflower-Bacon with Italian Parsley. As per usual, I didn't do anything in an exacting manner (I like "free-form" measurements) but here is the basic outline so that you can enjoy a nice bowl of creamy, chunky soup on a chilly autumn evening. -liquid to thin the soup- cream, chicken stock, water or even coconut milk will do. If you use water or stock, I suggest adding a bit of butter to add more fat. Put half of the cauliflower in the blender with the onions and add enough of your chosen liquids to reach desired consistency. Add salt and pepper. After the base is blended, add bacon, parsley and the other half of the cauliflower (chopped up) and season with the paprika to taste. This soup is flexible. You could blend all the cauliflower to make it creamier. You could add a bit of sharp cheese like pecorino or parmigiano-reggiano. You could leave out the bacon and paprika and use caraway seeds. You could add broccoli and cheddar. Lots of fun possibilities, so pimp your soup!